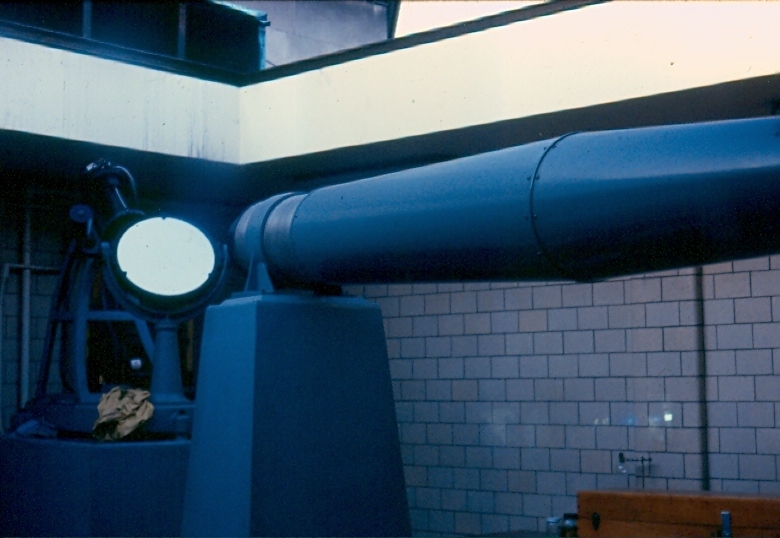 Pictured is the 10-inch Siderostat-Type Refractor Telescope in operation at Pittsburgh's original Buhl Planetarium and Institute of Popular Science (a.k.a. Buhl Science Center) in the 1980s. While the telescope tube is permanently mounted on a concrete pier (telescope tube does not move, except for the movements of the Earth), a flat first-surface mirror (which does move by an electric motor, with a clock-drive mechanism), behind the telescope, reflects images of the sky into the telescope. And, while the telescope remains out in the cooler air, people can look through the telescope while remaining in a heated room (i.e. a glass wall separates the eyepiece from the rest of the telescope). Seventy-five years ago today, on Wednesday Evening 1941 November 19, famous astronomer Harlow Shapley (then Director of the Harvard College Observatory) delivered the address at the dedication of The People's Observatory at Pittsburgh's original Buhl Planetarium and Institute of Popular Science. The primary instrument of America's fifth public observatory was a rather unique 10-inch Siderostat-Type Refractor Telescope. First Light through this telescope was the ringed-planet Saturn. The primary purpose of an academic or research observatory is to conduct astronomical research, as well as provide students with a formal astronomical education, while providing public tours and programs occasionally. The primary purpose of a public observatory is to present the heavens to the general public in an informal educational setting, even if occasional astronomical research is conducted. The idea of a public observatory began near the beginning of the twentieth century, although a couple public observatories started in the middle of the nineteenth century. Computer representation of the southern sky on the evening of the dedication of The People's Observatory – 1941 November 19 at 9:48:43 p.m. Eastern Standard Time (EST) / Nov. 20 at 2:48:43 Coordinated Universal Time (UTC). 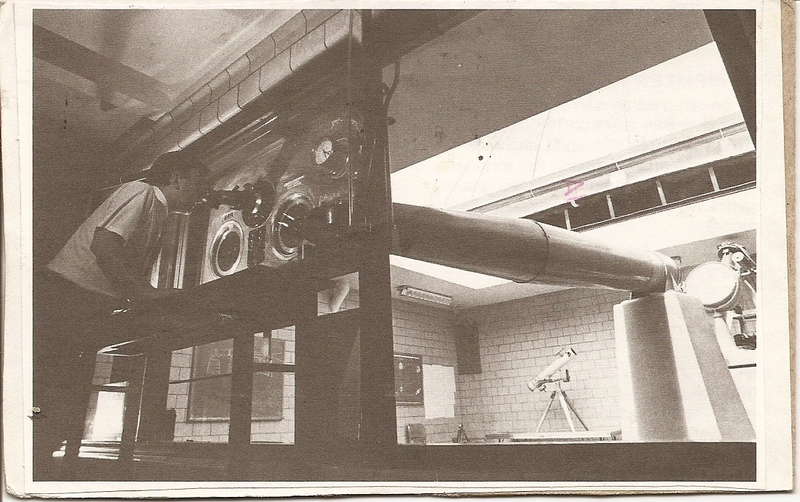 The original Buhl Planetarium Observatory chamber (which did not yet have an installed telescope), along with the rest of The Buhl Planetarium and Institute of Popular Science building (a.k.a. Buhl Science Center from 1982 to 1991), being America's fifth Zeiss planetarium installation and the last such facility built before World War II, was dedicated two years earlier on 1939 October 24. Upon the building dedication, the building and all Buhl Planetarium assets (including the contract to build a Siderostat-Type Telescope for the Observatory) were conveyed to the City of Pittsburgh by the Buhl Foundation (at that time, the thirteenth largest charitable foundation in the country), which had funded the entire building at a cost of $1.07 million in 1941 dollars (worth $18,077,267.86 in 2016 dollars). The Buhl Foundation constructed the building as a memorial to Henry Buhl, Jr. who had owned the North Side's major department store, Boggs and Buhl, which was located a block south of the Planetarium building. Buhl Planetarium was built on the site of the former Allegheny City Hall; Pittsburgh's “twin city,” Allegheny City was annexed by Pittsburgh in 1907 and became Pittsburgh's North Side. Although the 10-inch Siderostat-Type Refractor Telescope would not be ready for two more years after Buhl Planetarium opened to the public in 1939, Buhl's third-floor observatory space was used by volunteers from the Amateur Astronomers' Association of Pittsburgh (AAAP - which met monthly at Buhl Planetarium) for public observing with portable telescopes. East and West Wings of the Observatory were outdoor areas where portable telescopes were often deployed on an observing night, even after the dedication of the Siderostat-Type Telescope. After the Observatory dedication, the AAAP continued to organize evening observing sessions for many years. Leo Scanlon, an avid amateur astronomer who became one of the first Buhl Planetarium Lecturers, coordinated most of the Observatory's early observation sessions for the general public. Leo Scanlon, a plumber who lived in the Summer Hill section of the North Side, made astronomical history even before Buhl Planetarium opened. In 1930, astronomical observatory domes were constructed of steel, which, at that time, was thought to be the only metal strong enough to hold-up such a structure. That year, Leo Scanlon proved conventional wisdom wrong. In his backyard, he constructed a small astronomical observatory with a dome completely composed of aluminum. On the right is a photograph (Image Source: AAAP) of Leo sitting on top of the dome to show how strong the dome really is! This completely changed the way that astronomical observatory domes were constructed, from then-on. In 1929, Leo Scanlon co-founded the Amateur Astronomers Association of Pittsburgh. The next year, he and fellow club members took a road trip to Chicago to see America's first major planetarium, Adler Planetarium, which had just opened. These amateur astronomers were so impressed that they came back to Pittsburgh and immediately started lobbying for a planetarium to be built in their home city. In 1935, the Buhl Foundation agreed to build a planetarium, observatory, and institute of popular science for Pittsburgh. Before the Siderostat-Type Telescope was finished, one of the portable telescopes used was a 4-inch refractor telescope, which had come with the Zeiss II Planetarium Projector from the Carl Zeiss Optical Works in Jena, Germany in 1939. But, the Zeiss factory sent the wrong telescope, a terrestrial refractor instead of an astronomical refractor. Images in an astronomical refractor are upside-down, while extra optics which tend to degrade an image make an image right-side-up in a terrestrial refractor. In the month before Buhl Planetarium opened, Hitler had invaded Poland and World War II had begun. Hence, the 4-inch Zeiss could not be returned to the German factory for a replacement. Buhl Planetarium had to make-do with the terrestrial telescope. This City of Pittsburgh-owned telescope is still used today at the Henry Buhl, Jr. Planetarium and Observatory of The Carnegie Science Center. scope, a terrestrial refractor, instead of an astronomical refractor. & Observatory of The Carnegie Science Center. Buhl's original astronomical observatory, along with the 10-inch Siderostat-Type Refractor Telescope, was constructed to research observatory specifications at a cost of $30,000 (in 1941 dollars) but was specifically designed to be a public observatory. In today's dollars (2016), that cost would equal more than a half-million dollars ($503,244.68). The 10-inch Siderostat-Type Refractor Telescope was manufactured by the Gaertner Scientific Company of Chicago. The company took five months to plan construction of the telescope and two years to actually build it; each of its thousands of parts was specially designed and hand-made. Unlike most telescopes, a 10-inch Siderostat-Type Refractor Telescope (with a 12-foot steel, telescope tube) is mounted, horizontally, on a concrete pier; the telescope, itself, does not move, save for the movements of the Earth. Behind the telescope on a second pier is a flat, first-surface mirror (made of pyrex glass, 18 inches in diameter and two and three-quarter inches thick) that moves via an electric motor on a Sidereal Coelostat or Siderostat unit. The mirror reflects the image of part of the sky into the telescope. An electric-driven clock-drive mechanism moves the mirror at the same rate of speed as the rotation rate of the Earth, allowing an image in the telescope to appear stationary. The entire telescope and Siderostat mechanism weigh one and one-half tons. Since a Siderostat-Type Telescope does not and cannot move, you do not point this type of telescope to find a star or planet you wish to look at. Instead, you dial-in the correct celestial coordinates (right-ascension and declination) on the electric-driven mechanical dials. This is the 1941, state-of-the-art version of computer-controlled telescopes of today. These electric-driven mechanical dials are the center-piece of the telescope's Control Console panel, located on an elevated Observing Platform, three steps above floor level. The end of the telescope, where the proper power-of-magnification eyepiece is installed, is also located on the Control Console; this is where people look into the telescope. When observing the Sun, the solar image is safely projected from the eyepiece onto a large projection screen. The Control Console includes a special housing for the six original eyepiece lenses, with magnifications ranging from 65-power to 490-power. In later years, newer, more standardized lenses were acquired, which required an adapter to use with this telescope. The 65-power and 80-power eyepieces were used for most public observing sessions. Originally, the correct coordinates came from almanacs such as the U.S. Naval Observatory's annual Astronomical Almanac (for the Sun, Moon, and planets) and the Royal Astronomical Society of Canada's annual Observer's Handbook (for stars). Of course, today such proper coordinates could come from various data bases or the Internet. A special clock, which tells local sidereal time [star time, as opposed to our normal clocks which give a version (Standard Time or Daylight Saving Time) of Sun time], is also necessary for deriving the proper coordinates to find objects with a Siderostat-Type Telescope. Originally, a large sidereal clock was located on a side wall, next to the west entrance to the Telescope Room. By the 1970s, a smaller sidereal clock was mounted on the Control Console, while a normal clock took the place of the large sidereal clock on the side wall. Unlike astronomical observatories most people are used to, a Siderostat-Type Observatory is not enclosed in a dome. A roll-away roof is used for the telescope to access the sky. During the 50 years of use at the original Buhl Planetarium, staff members would open and close this roof by pulling a heavy . chain (while wearing heavy work gloves). Although motorizing the roof was considered, it never received funding. People can look through the telescope in a heated Observing Room, while most of the 10-inch Siderostat-Type Refractor Telescope remains in the cooler air. A glass wall or partition separates the Observing Room from the Telescope Room, so you can see the rest of the telescope and the mirror on the Siderostat unit move. Hence, while some observatories limit public observing during the cold-weather months, a 10-inch Siderostat-Type Refractor Telescope can be used for public observing all year-round, so long as the sky is relatively clear. In most other observatories, a member of the public may have to strain their neck, or climb a movable staircase, to look through a major telescope. With a 10-inch Siderostat-Type Refractor Telescope, the eyepiece lens, where a person looks through, is always in the same position, designed for comfortable viewing. Another unique advantage to this Siderostat-Type Telescope Observatory was that, for evening observing sessions, the telescope could be left unattended for short periods of time. Once the telescope was fixed on a particular object, the clock-drive mechanism would be activated and the object would stay in view indefinitely. Then, the Control Console was locked. The two doors to the Telescope Room were locked. Even locking light switches were used so the public could not turn the Observing Room lights off. Then, the public could easily just walk up to the Observatory, climb the three steps to the Observing Platform, and look through the telescope. The telescope was “polar-aligned” in the Telescope Room of the Observatory, which means the telescope was permanently mounted pointing at the cardinal point of true north, with the Siderostat mirror pointing south. Hence, this permanently-mounted telescope is specifically designed to look at the southern sky (location of the ecliptic, home of the Sun, Moon, and planets), as well as large portions of the eastern and western skies. While evening viewing is very popular with the 10-inch Siderostat-Type Refractor Telescope, this telescope was also used during the daylight hours. The primary use of the Siderostat-Type Telescope during the daytime was for viewing the Sun. In this case, the image of the Sun is projected from the telescope onto a large, circular projection screen. On the screen, the public can easily and safely view sunspots, violent magnetic storms on the surface of the Sun, which are cooler than the rest of the surface of the Sun, hence why they appear black. With most sunspots, the public can easily see the central umbra (darkest part of a sunspot) and the lighter penumbra surrounding the umbra. Solar granulation on the solar surface could also be seen. On the projection screen, there are two small circles at the extreme right and left sides of the screen. These circles represent the size of the Planet Earth, depending on what power of magnification eyepiece lens is used for observing the Sun. The smallest circle represents the Earth, when a 65-power eyepiece lens is used to view the Sun and sunspots; the larger circle represents the Earth, when an 80-power eyepiece lens is used to view the Sun and sunspots. Hence, the public can easily see how large a sunspot is compared to the size of the Earth; often, the size of a sunspot exceeds the size of the Earth. A demonstration, which shows how fast the Earth rotates on its axis, is to view the Sun on the screen, particularly when sunspots are in view, and then deactivate the clock-drive motor. The Sun and sunspots quickly move across the screen, the speed depending on the power of the eyepiece lens used. The stronger the eyepiece lens, the faster the image moves across the screen; when you magnify the size of the image, you also magnify the speed of the motion of the image on the screen. Of course, the image is not really moving across the screen; the image on the screen remains stationary while the screen is moving along with the Earth as our planet rotates on its axis. However, daytime viewing was not limited to the Sun. The Moon, and the planets Mercury, Venus (including the planet's phase), Mars, and Jupiter (including cloud belts) were often viewed. And, with the 10-inch Siderostat-Type Refractor Telescope, stars down to third magnitude of brightness were also seen in the daytime. In the mid-1980s, a computer screen was mounted near the Control Console, which showed the public a computer display of the part of the sky that was being observed with the telescope at that particular time. On the wall opposite from the telescope Control Console, a series of back-lit transparencies showing astronomical objects was displayed. And, several small Astronomy and Space Science exhibits were also displayed in the Observatory, mostly behind the glass partition. For a while, a small Weather Station was located just outside the third-floor, west entrance door to the Observatory. Although in the beginning, communication between the Observatory and the first-floor was by a buzzer signal, a touch-tone telephone was added in the mid-1980s with the easy-to-remember telephone number: 412-237-3350. The Telescope Room was often used as a classroom, during Buhl Planetarium's weekly Saturday and Summer class sessions. Since the Telescope Room was not heated, a portable space-heater was used during these classes. For many years, a blackboard was mounted on the west wall in the Telescope Room for these classes. To avoid chalk dust getting on the telescope and Siderostat mirror, the blackboard was removed in the 1980s. In the beginning, the Buhl Planetarium building was open to the public, free-of-charge for the first year (although there was a small fee for attending a planetarium performance), seven days-a-week from 10:00 a.m. to 10:00 p.m., except New Year's Day (beginning in the 1960s, Christmas Day was the only day the building was closed to the public). Buhl Planetarium's Observatory would be open every evening, weather-permitting. In 1985 and 1986, the Buhl Planetarium Observatory used several telescopes, including the Siderostat-Type Telescope, to show the public the famous Halley's Comet. A new 13-inch Dobsonian reflector telescope was also purchased for this special event. People were charged one dollar for viewing Halley's Comet, and many days there were long lines of people waiting to get a view through a Buhl telescope. Although by 1982 most of the Buhl Planetarium building had been made handicapped-accessible, the third-floor Observatory, and the Library and offices on the second floor, were still not accessible at that time. During “Halley Watch,” several staff members simply carried a disabled person, wheelchair and all, up to the Observatory, so they would not miss this event! At other times, a portable telescope would be taken outside for viewing by the disabled. 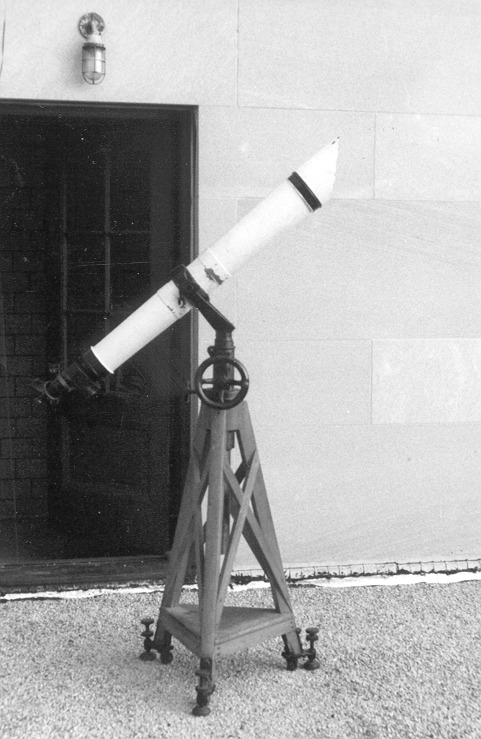 Of course, the Siderostat-Type Telescope was used to show solar and lunar eclipses to the general public. Usually, the admission fee was waived during a solar eclipse, so the public would have a safe way of viewing the event, without trying to look at it on their own. For the Solar Eclipse of 1991 July 11, gentlemen from the Amateur Transmitters' Association of Western Pennsylvania (amateur radio club which met at Buhl Planetarium monthly) participated with the Observatory in an experiment to see if the Moon blocking the Sun improved radio reception during the eclipse. The results were inconclusive, probably because the Moon only blocked a small part of the Sun in Pittsburgh, during this particular eclipse. Public observatories were a new idea in the 1930s, although there had been a couple earlier ones. Both the Cincinnati Observatory (1845) and the Allegheny Observatory (1861) in Pittsburgh had opened as public observatories, but some years later both became affiliated with universities. However, when the new Allegheny Observatory building opened in 1912, famous local telescope-maker John A. Brashear (former University of Pittsburgh Chancellor, who had personally done all of the fund-raising for the new building) insisted that one of the three domes (the smallest one housing the Observatory's historic, 13-inch Fitz-Clark Refractor Telescope) be set-aside as a public observatory. As part of the University of Cincinnati, the Cincinnati Observatory continued its academic responsibilities, along with providing some public programming, until the 1980s. In 1999, the Cincinnati Observatory returned to being a true public observatory, operated by a new non-profit organization, the Cincinnati Observatory Center. The historic Yerkes Observatory (1897) in Williams Bay, Wisconsin, operated by the University of Chicago, has recently undergone a similar transformation to become a public observatory. by the general public at the new (1912) Allegheny Observatory. In 1934, a public observatory also opened at Franklin Institute in Philadelphia, which had just opened the Fels Planetarium. In Los Angeles in 1935, a three-domed Griffith Observatory opened, with the two smaller domes housing public observatory telescopes and the large middle dome housing a planetarium. Dedicated as "The People's Observatory" in 1941, this name emphasized that the primary purpose of this new Buhl Planetarium Observatory would be to display the heavens to the public. However, the “People's Observatory” name fell out of favor and use after World War II. During the Cold War, the proliferation of Communist states known as "People's Republics" tarnished the meaning of the word "People's." Hence, "The People's Observatory" name was no longer used--which is a shame considering that Buhl Planetarium used the term "People's" first! Another interesting, historic anecdote regarding the opening of Buhl's People's Observatory: On the same evening of the Observatory dedication, Buhl started a new Planetarium Sky Show and opened a new gallery exhibit. The Sky Show, regarding Celestial Navigation, was titled "Bombers by Starlight" (Buhl provided Celestial Navigation classes to many military servicemen, during World War II). The new exhibit in Buhl's lower-level Octagon Gallery (which surrounds the Planetarium Projector Pit, below the Planetarium's "Theater of the Stars") was titled, "Can America Be Bombed?" This exhibit opened two and one-half weeks before the Japanese bombed Pearl Harbor, Hawaii! occurred at Pittsburgh's original Buhl Planetarium and Institute of Popular Science. at the Cleveland Museum of Art in 1942. Although primarily used for public observing, the Siderostat-Type Telescope has been used for some research, from time-to-time. During the 1980s, Buhl Planetarium Lecturer Francis G. Graham (Founder of the American Lunar Society, who is now Professor Emeritus of Physics, Kent State University) took photographs of the South Pole area of the Moon with the telescope, as part of a cooperative research project with other American astronomers. These photographs aided the production of a better map of the South Pole area of the Moon, than existed at that time. The Sidereal Coelostat or Siderostat-Type Telescope was designed and invented by the famous French physicist Jean Bernard Leon Foucault, in the middle of the nineteenth century. However, Mr. Foucault was a sickly man who died before he had a chance to build such a telescope. Of course, Mr. Foucault also invented the Foucault Pendulum, which is a classic demonstration that the Earth rotates on its axis. A Foucault Pendulum, in a beautiful brass and marble Pendulum Pit, was one of the original exhibits on display when Buhl Planetarium opened to the public in 1939. And, this Foucault Pendulum continues swinging in its original location in Buhl Planetarium's Great Hall, now part of the Children's Museum, to this day. Photograph from 1956 of a cub scout group learning about Buhl Planetarium's Foucault Pendulum. Pittsburgh's 10-inch Siderostat-Type Refractor Telescope was one of three large Siderostat-Type Telescopes that have been constructed. Regrettably, all three have been dismantled, and only two of them (including Pittsburgh's) could be reassembled. The first one built also lays claim to the largest refractor telescope ever constructed. But, it is also the one that was dismantled and scrapped. To be the prime exhibit in a world's fair heralding the beginning of the twentieth century, the French government commissioned a massive telescope to be built for the Paris Exhibition of 1900. Two 49-inch objective lenses were produced for this telescope; one lens for public viewing, the other for photography. Photograph of the Great Paris Exhibition Telescope of 1900. Today, the largest refracting telescope in existence is the 40-inch refractor telescope at Yerkes Observatory in Williams Bay, Wisconsin, operated by the University of Chicago. The University of Pittsburgh's Allegheny Observatory has the world's fifth largest refractor telescope [it was the third largest photographic refractor telescope before being converted to using the Multi-Channel Astrometric Photometer (MAP) in the 1980s]: 30-inch Thaw Memorial Refractor Telescope. After the year-long Paris Exhibition, the company which had been organized in 1886 to build the telescope went bankrupt. Consequently, the telescope was put-up for auction in 1909. No one purchased the telescope, and eventually it was scrapped. However, the historic lenses are still in the possession of the Paris Observatory. Around 1929 a Philadelphia businessman, Gustavus Wynne Cook, who was also an avid amateur astronomer, built the Roslyn House Observatory at his suburban Philadelphia estate. This observatory was constructed in two buildings to house two major telescopes, including a 15-inch Siderostat-Type Refractor Telescope (To the right is a photograph of this telescope in the Rosyln House Observatory, circa 1935. Image Source: University of Pennsylvania). This Siderostat-Type Telescope included a 15-inch objective lens produced by Pittsburgh's John Brashear Company and a telescope mount produced by Pittsburgh's J.W. Fecker Company (which was the immediate successor to the John Brashear Company). The second telescope was a large 28.5-inch reflector telescope, produced by the J.W. Fecker Company. After Mr. Cook's death in 1940, the telescopes were donated to the University of Pennsylvania. 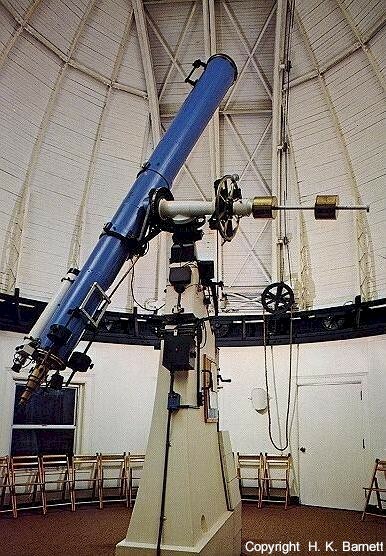 At a new suburban site in 1956, the Cook telescopes joined an 18-inch Warner and Swasey Refractor Telescope (with a John Brashear lens) purchased with money that had been bequeathed to the university by another Philadelphia businessman, Reese Wall Flower. Thus was established the Flower and Cook Observatory of the University of Pennsylvania. In 2004, the University of Pennsylvania sold the property which included the Flower and Cook Observatory. In 2007, the two Cook telescopes, including the Siderostat-Type Telescope, were donated for use at the Florida Community College of Jacksonville, in cooperation with the Northeast Florida Astronomical Society. This is where the story gets murky. This Siderostat-Type Telescope has never been reassembled, and there is no evidence that there are any plans to reassemble this telescope in the foreseeable future. James S. Stokley, Buhl Planetarium's first Planetarium Director, was previously Director of the Fels Planetarium at Franklin Institute in Philadelphia. Before coming to Buhl, he served as a consultant while Buhl Planetarium was being designed and constructed. After seeing Mr. Cook's Siderostat-Type Telescope in the Philadelphia suburbs and realizing how valuable this type of telescope would be for public observing, Mr. Stokley recommended installing a Siderostat-Type Telescope at Buhl Planetarium. Smaller Siderostat-Type Telescopes exist for specialized applications in astronomical observatories and government laboratories, as well as in educational institutions. For instance, a 6-inch Siderostat-Type Refractor Telescope is used, primarily for solar observing, by students in a school in Luzern, Switzerland. Over the years, with funding restraints reducing Buhl Planetarium's evening hours, the AAAP opening their own observatories (first Wagman Observatory in the North Hills, and some years later Mingo Observatory in the South Hills), and the continual problem with weather interferences with observing, operation of the original Buhl Planetarium Observatory waned, except for some solar observing in the daytime hours. As a cost-cutting measure in June of 1984, Buhl management eliminated all evening hours, except during the annual exhibition of the very popular Miniature Railroad and Village (November through February); all other months only laser-light concerts were offered in the planetarium during evening hours, Thursday through Sunday. In January of 1986, the Golden Triangle Association business group (forerunner to today's Pittsburgh Downtown Partnership), proposed that Downtown merchants stay open until 7:00 p.m. on weeknights, as a way to create a more active Downtown Pittsburgh area. As Buhl Planetarium was located less than a mile from Downtown, Buhl staff member Glenn A. Walsh proposed, in a memorandum to his supervisors, that Buhl participate in this initiative by reopening Buhl Planetarium at least one night a week—Friday night. To the surprise of the entire staff, including Mr. Walsh, his proposal was approved. With the reopening on Friday nights, Mr. Walsh, as the new Astronomical Observatory Coordinator, started opening Buhl's Observatory every Friday evening, weather-permitting, year-round, from 7:30 to 10:30 p.m. Prevailing Time. By the mid-1980s, Buhl had a very active volunteer program. Several volunteers assisted Mr. Walsh with public observing sessions on Friday evenings and on Sunday afternoons, as well as at other times during the week and during special events. This continued until Buhl Planetarium closed as a public museum on 1991 August 31. When Pittsburgh's Carnegie Science Center opened on 1991 October 5, the 10-inch Siderostat-Type Refractor Telescope was used for Science classes, as the original Buhl Planetarium building became a tutorial center where all of The Carnegie Science Center's Science classes and teacher development courses were taught. Originally, The Carnegie Science Center building was built without classroom space, as it had been decided that all classes would be taught at the original Buhl Planetarium building, which was then known as the Allegheny Square Annex of The Carnegie Science Center. In February of 1994, the Allegheny Square Annex was closed as a cost-cutting measure. The 10-inch Siderostat-Type Refractor Telescope then went unused until October of 2002 when it was dismantled and placed in storage at The Carnegie Science Center warehouse. After closure of The Carnegie Science Center's Allegheny Square Annex (i.e. original Buhl Planetarium building) in 1994, both the 10-inch Siderostat-Type Refractor Telescope and the Zeiss II Planetarium Projector were no longer used in an empty building, which was eventually returned to the City of Pittsburgh. However, in the Spring of 1995, Carnegie Science Center management proposed, to the City, to sell the Zeiss II and Siderostat-Type Telescope to Navarro College in central Texas, so the Science Center could fund the purchase of a Digistar II Planetarium Projector for their new planetarium. Ironically, Navarro College had no plans to use the Zeiss II or Siderostat-Type Telescope; they would have simply been displayed as antique artifacts. Glenn A. Walsh, former Astronomical Observatory Coordinator and Planetarium Lecturer at the original Buhl Planetarium, spear-headed a grass-roots effort to stop this sale. Mr. Walsh successfully petitioned for a special public hearing, regarding this sale, before Pittsburgh City Council in May of 1995. At the public hearing, after Pittsburgh City Council learned how historic these two pieces of scientific apparatus really are, City Council did not allow the sale of the Zeiss II and Siderostat-Type Telescope to go forward. In 2002, in anticipation of the reuse of the original Buhl Planetarium building by the Children's Museum, the City issued an RFP (Request for Proposals) regarding the future use of the Siderostat-Type Telescope. The newly-formed Friends of the Zeiss organization responded with a proposal to use the telescope, in-place, to benefit children visiting the Children's Museum. The Carnegie Science Center told the City they would store the telescope until it could be installed in a future Science Center addition. With a legal Memorandum of Understanding, the City accepted the Science Center's proposal. In 2004, the original Buhl Planetarium building reopened as part of an expanded Children's Museum of Pittsburgh; this museum had started in 1983, across the street from Buhl Planetarium in the Old Allegheny Post Office building (built in 1897). The original observatory chamber was converted into a Board Room for the Children's Museum. The Theater of the Stars, the original planetarium theater, became an exhibit gallery, as the Zeiss II Planetarium Projector was also dismantled and placed in storage. The Carnegie Science Center reassembled the Zeiss II Planetarium Projector in July of 2010 in their first-floor Atrium Gallery, as a non-working exhibit (although the projector does turn 360 degrees once an hour). The Carnegie Science Center had not, originally, planned on having an astronomical observatory. However, when Buhl Planetarium Director Paul Oles secured additional funding from the Buhl Foundation for an astronomical observatory, a 16-inch reflector telescope with a CCD camera (to transmit images from the observatory into the planetarium) was purchased, along with a dome. The Carnegie Science Center roof was not designed to accept the weight of more than a few people at a time. So, the observatory had to be installed on top of a staircase tower, which was strong enough to hold the observatory. The public could not access the observatory; only CCD images in the planetarium could be used from the observatory. Shortly after The Carnegie Science Center opened in 1991, the new Henry Buhl, Jr. Planetarium and Observatory brought-in an intern from an Ohio college to begin an astronomical research program regarding variable stars. This seemed to be the type of astronomical research that could be conducted from a facility on the north shore of the Ohio River, just a mile from Downtown Pittsburgh's Golden Triangle. However, this new telescope never worked properly. And shortly thereafter, the company that manufactured the telescope went bankrupt. So, any warranty on the telescope was useless. Hence, this new observatory went dark for several years. Just before the beginning of the new millennium, The Carnegie Science Center purchased a new 16-inch Meade LX200 Schmidt-Cassegrain Reflector Telescope. And, the telescope and dome were moved from the top of the staircase tower to a fifth-floor observation deck. Now, the public could access the observatory and look through the telescope. Although the telescope had reasonably good views of the southern, eastern, and western skies, the northern sky was now blocked by the fifth floor wall behind the observatory. Further, since the observation deck had not been designed for an observatory, vibrations from people walking around the building affected views through the telescope. As the original Buhl Planetarium Observatory had been designed to be an observatory, the two piers for the telescope and the Siderostat unit had been designed and built as part of the building foundation during construction of Buhl Planetarium, to avoid the vibration problem. Last month, The Carnegie Science Center unveiled a plan to build a $21 million building expansion and then reneged on their promise to install the historic Siderostat-Type Telescope in this future building addition. Was the Science Center ever serious about installing this telescope in a building addition? Or, was the Science Center's true goal to dismantle the telescope so neither Friends of the Zeiss, nor the Children's Museum, could use this telescope in competition with the Science Center's new 16-inch reflector telescope? Sadly, the evidence now seems clear the Science Center's true motive was to prevent competition with their new telescope! Now, the historic Siderostat-Type Telescope has no home. The telescope's previous home is now used as a Board Room for the Children's Museum. Had the telescope not been dismantled, there would be no major cost for its reuse, and the telescope could have benefited children visiting the Children's Museum over the last decade. However, a major re-installation cost means that this historic 10-inch Siderostat-Type Refractor Telescope will likely remain in storage indefinitely, educating no one. At this point in time, it is unclear when this City-owned telescope could be reassembled and used once-again for the benefit of the residents of Pittsburgh. Special Note: The author, Glenn A. Walsh, served as Astronomical Observatory Coordinator at The People's Observatory of Pittsburgh's original Buhl Planetarium and Institute of Popular Science (a.k.a. Buhl Science Center) from 1986 to 1991. Radio Interview Regarding 75th Anniversary of Buhl Planetarium Observatory. Audio: Radio Interview. Larry Berger, host of the Saturday Light Brigade children's / family radio program, interviewed Glenn A. Walsh on the 75th anniversary of the Astronomical Observatory of Pittsburgh's original Buhl Planetarium and Institute of Popular Science, which was dedicated on 1941 November 19. "155th Anniversary of Allegheny Observatory: The Very 1st Director." 2016 Nov. 27. "Proposed Carnegie Science Center Addition Omits Historic Telescope." "165th Anniversary: Foucault Pendulum." 2016 Jan. 8. "170th Anniversary: America's 1st Public Observatory." 2015 April 14. "70th Anniversary: Buhl Planetarium Observatory." 2011 Nov. 19.